As users at your customers generate individual events (e.g. Login, Button clicked, Purchase made), we'll keep track of the total number of times that event has been seen for every customer. We also show a percentage increase/decrease in the event total for the last 30 days compared to the total for the prior 30 days. 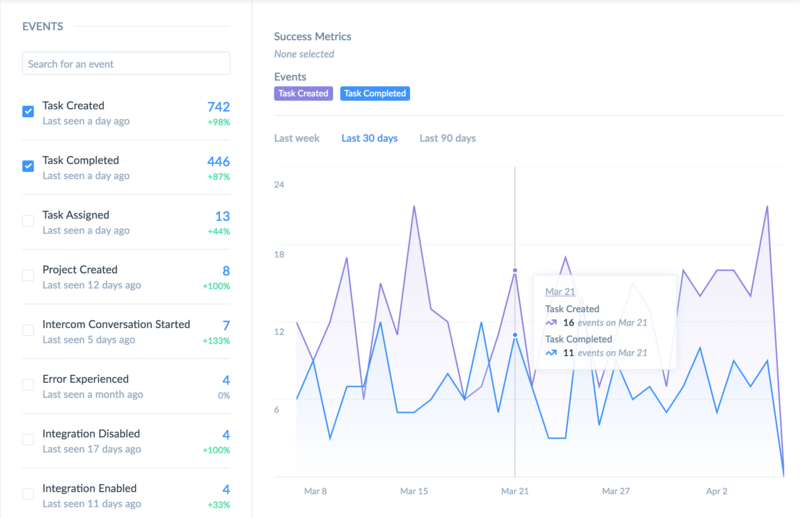 You can also view how often a customer's users have generated specific events over time on each customer's dashboard. Along with event totals, we also track the last time any user at a customer generated a specific event. Not only can you view event counts for every (account, event) combination, but you also have access to histograms showing a breakdown of event counts across all accounts. As with all Vitally data, you can filter the account set displayed in the histogram using the filters on the left. You can also aggregate accounts by MRR to see how much MRR belongs to each bucket! And finally, simply click on a bucket to see its accounts. For every customer, we track the first and last time any user at the customer 'used' your product. This is determined using events sent by users. Note that if you are using an analytics service like Segment, we only update these timestamp for new track events and not other API calls like identify, group, or page. 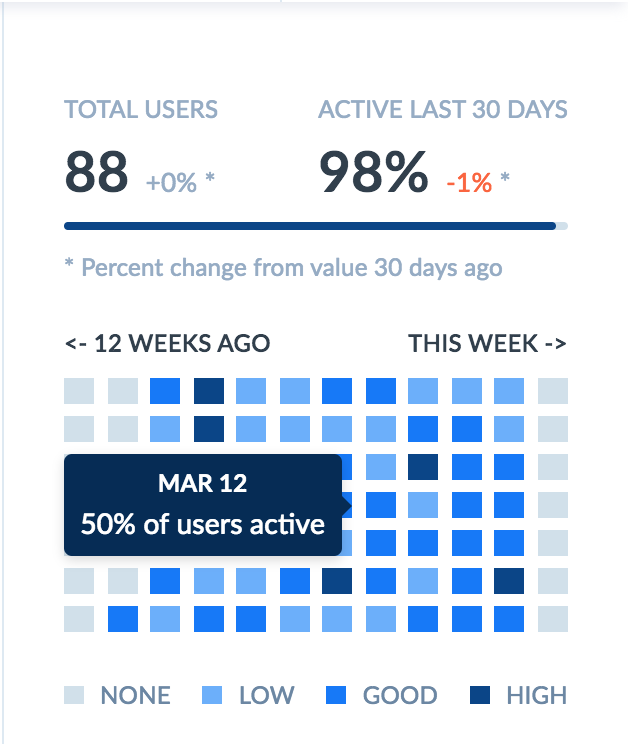 A simple yet critical metric, Active user percent is the percentage of users at each customer that have used your product over the last 30 days. Thus, if your business has a seat-based pricing model, this reports the percentage of licenses active at each customer. Every customer dashboard also shows a breakdown of daily active user percentage for every day over the last 12 weeks. Elements allow you to easily track if customers have used the core features of your product. We provide you with a count of the Elements used by each customer, allowing you to easily understand if each customer is setup for success. Vitally also provides default columns and filters for your Accounts that tracks important details about the Account Owner, like how often they've communicated with you and used your product. See our documentation on Account Owners to learn more. If you enable an integration that sends your customer conversations to Vitally (e.g. Gmail, Intercom), we'll track both the last date anyone on your team sent a message to any user at the customer as well as the last date any user at the customer sent a message to anyone on your team.